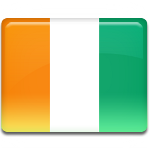 Ivory Coast declared independence from France on August 7, 1960. The first 20 years of independence saw a steady economical growth of the state. The distraught of the 1980s marked the beginning of the era of political instability. In 1999 the military officers organized a coup to put General Robert Guéï in power. The next presidential elections of 2000 were followed by the public uprising. In 2002 the civil war outbroke in the country, that lasted till 2007. Due to the civil war the presidential elections couldn't be organized in 2005 and they were postponed till 2010. The result of the elections led to the second civil war in 2010-2011. The political situation in Côte d’Ivoire isn't stable, that is why governess of the state instituted National Peace Day. Celebration of this holiday should set aside the rivals and restore the peace.